The Easter Bunny is sure to deliver fun—and more than a few giggles!—on Easter Sunday with this bumper crop of Surprise Heirloom Carrots! 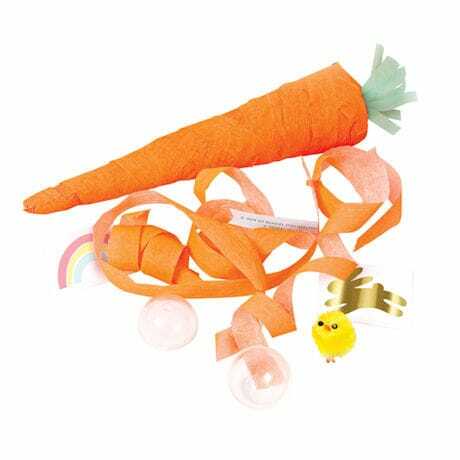 Crafted of colorful crepe-paper ribbon, these "carrots" unravel to reveal several small surprises hidden inside. The prizes vary and may include jokes, temporary tattoos, and other whimsical treats. We're offering the 8" carrots in a pack of four, so you'll have plenty to tuck into Easter baskets or serve along with Easter lunch. For ages 3 and up.